I’m sure you know the feeling of being trapped, tired of your routine and a lack of adventure. During this warm winter in the Northwest, rains have washed away many weekends of outdoor activity. 2015 has been the second of such winters where Nikki and I have felt trapped in town. By mid January, we needed an escape. We traveled to Salt Lake for the long President’s day weekend in February. Part of our motivation for this trip was to visit Chris, Nikki’s brother. Chris was a lovely host to have driven us around and shown off his home of many years now. We stayed with him at his rental house in a central zone in the city. We were only blocks away from Sam and just a short walk further to Reid’s house. We felt at home wandering the neighborhood visiting friends. The riding wasn’t top notch in Salt Lake at the time of our visit. Our trip resulted in many unexpected qualities aside from snowboarding. Wandering around the city on bikes during a down day. A Valentine’s dinner at Sam’s house. The model train shop fake trees purchase. Dinner with Jacob and Nicole. Each time I visit SLC, I enjoy the camaraderie of a crowd who knows how to have a good time. We did snowboard however, I do realize this a snowboarding blog. We learned an important lesson this trip, one that any respectable boarder should know. There is a beach at Brighton. Nikki and I learned first hand about 50 degree days at the parking lot beach. We rolled in late, took few runs and then BBQ’ed behind Sam’s truck on “Brighton beach”. Sam and Reid pulled through for us with a well cooked meal and sports drinks. The afternoon was spent making high-speed, non-park park laps on Milly in a train of 8 riders. The sports drinks allowed for some extra air time and added comedy. Topping off the snowboard adventure was Sunday’s bi-caynon tour. Reid and Sam set me up with a proper Utah experience. We hitchhiked up Little Cottonwood canyon. 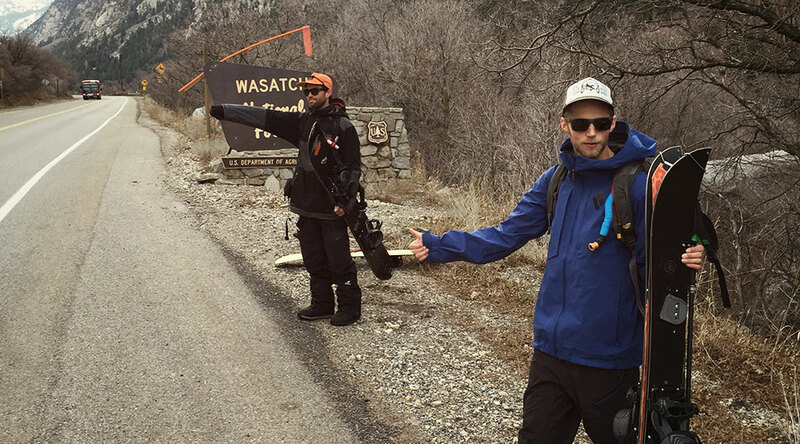 From Alta, we climbed an icy, sketchy canyon wall to a beautiful ridge-line, only to exit out of Big Cottonwood canyon and hitchhike back down to a second vehicle. 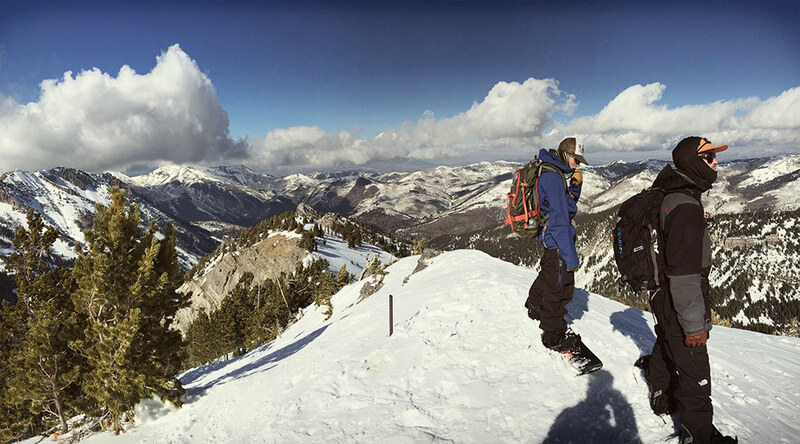 While at the summit, I got a first hand look at the heart of the Wasatch touring terrain. Despite it’s small area, there are lines everywhere. The snowpack was solid, allowing for ski turns to be laid down in every direction, up and down the range. The turns one can find in the Wasatch backcountry could “keep you busy for a lifetime” said Sam, which is a quote now stuck in my head. 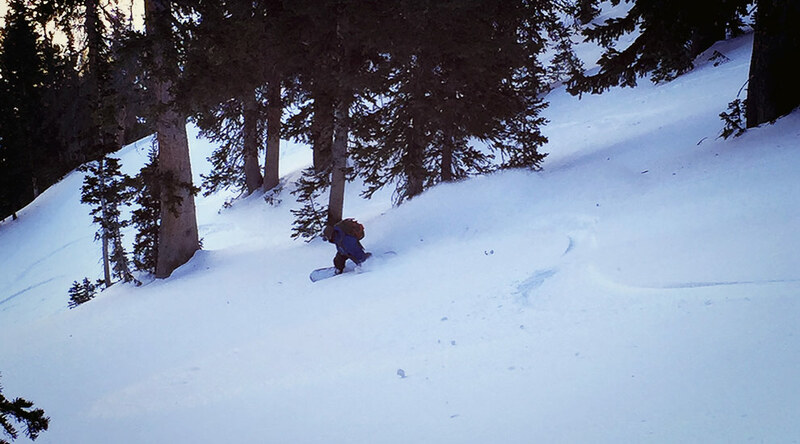 For our runs, we did find some old powder that rode surprisingly well. We made 2 fun laps. The second being a 1500ft vertical foot powder run taking us to the valley floor. 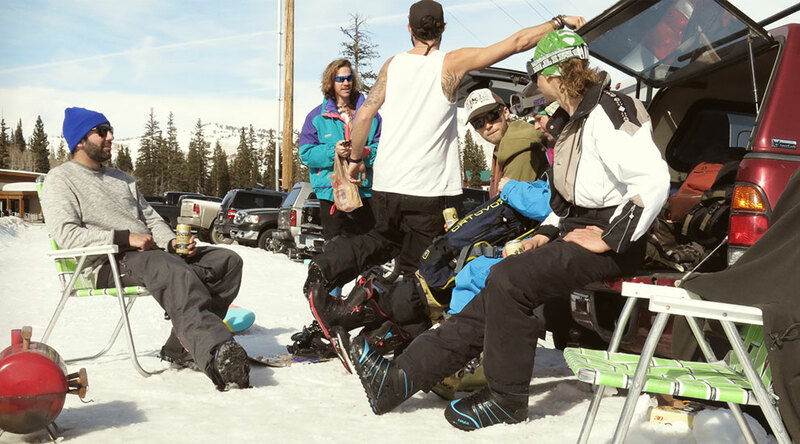 It was an action packed run that started with a toast at the summit over 9% beers. The line itself held lots of exposed features from the low snow year, making for a rowdy ride. The run out of this zone was the highlight though. I wish such conditions upon no one. Maybe it was the beers but Reid, Sam and I seemed to enjoy the 3 miles of torturous ice luge through a narrow woods trail out to the highway. Ice, no dust on top, tight with trees and features throughout the trial. Riding fast, my game face was on until I went down while pumping for speed and smacked it into the icy crust. The mountain wiped my game face off so I resorted to the age old “laughing at one’s self” technique. Returning to the city after a weekend away always feels good. It’s nice to crawl into your own bed. Work that week feels important and new again. The sights and frights from a weekend away keep my mind satisfied. I didn’t come home with a quenched thirst of powder boarding but I was very pleased to get out of town and get a quick refresh on my perspective.